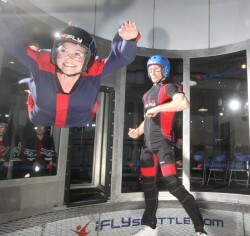 This year for Staff Appreciation Day Dr. Nichole Martin took us all indoor skydiving. Everyone got to experience flying for about three exhilarating minutes. We all had so much fun! Even those that were a little timid about it at first ended up loving it. Thank you Dr. Martin for a great day! If you want to make an appointment with the coolest dentist in Lynnwood call us at (425) 774-5596 to schedule today.